Formerly Little Nashville, the historic building at 115-117 S. Main St. in downtown Urbana will undergo rehabilitation work this fall. On Wednesday, the Ohio Development Services Agency announced it has awarded the property owners – John and Roy Doss – an Ohio Historic Preservation Tax Credit totaling $31,250 to help cover a portion of the estimated $222,686 project. A historic downtown Urbana building is about to get a new lease on life thanks to the efforts of two local brothers and the state of Ohio. 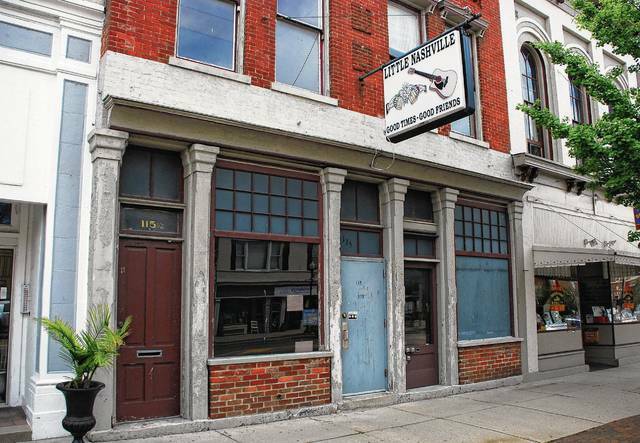 On Wednesday, the Ohio Development Services Agency (ODSA) announced it awarded an Ohio Historic Preservation Tax Credit totaling $31,250 for the rehabilitation of 115-117 S. Main St., a two-story commercial building built in the 1890s that was most recently home to Little Nashville (bar). At an estimated cost of $222,686, the rehabilitation project is expected to start this fall and be completed by the end of the year, said local businessman John Doss, who along with his brother, Roy, purchased the downtown property in June 2016. While Doss said there isn’t much appreciation or increase in the value of property over time in downtown Urbana, he and Roy decided to take a chance on the building a few doors from their Dye & Doss Insurance Agency, 127 S. Main St. The plan, he added, calls for the 2,608-square-foot retail/office space on the first floor to be rehabilitated as well as the 1,867-square-foot second story, which contains two one-bedroom apartments. While researching old records for past tenants, Doss said, he discovered a number of interesting tidbits. For example, he said Charles Millner operated a restaurant in the building during the late 1800s and early 1900s. In 1902, Millner remodeled the restaurant and renamed it D.S.&U., due to its close proximity to a stop on the Dayton, Springfield, and Urbana Electric Railway. Other businesses Doss found to have operated at the location include Lowry Bros. (fur trade), French & Kenton Grocery, Merchant Tailors, Cleaners and Dyers Cleaner; The Brass Rail (saloon) and El Paso. Since property investments in small communities don’t always result in the same bang for the buck as they do in bigger cities like Columbus, Doss said, the Ohio Historic Preservation Tax Credit is becoming a valuable tool for places like Urbana and is a primary reason he and his brother can move forward with the rehabilitation project. For example, Doss added, a renovated property in Columbus could be rented for $14 a square foot, while the same investment in Urbana would likely bring in a rental income of around $4 per square foot. Doss said the state of Ohio is aware of this disparity and is “trying to help out the small towns” through programs like the Ohio Historic Preservation Tax Credit. “People haven’t been taking advantage of this program enough, but it’s starting to catch on,” he said. Statewide, 30 applicants were awarded preservation tax credits totaling $34,977,855, and the ODSA press release states this is the first time a property in Urbana has been awarded the tax credit.